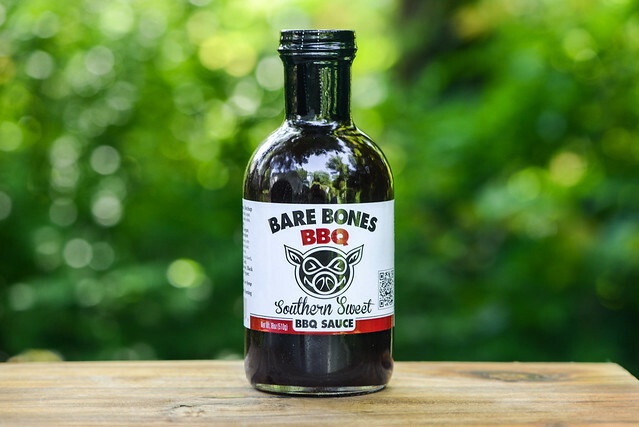 Sugary sweet, but with enough barbecue backing and quality ingredients to give it character, Bare Bones Southern Sweet is likely a crowdpleaser. Shannon Vaughn and Travis Penn head up Bare Bones BBQ—a competition and catering outfit running out of Blountville, TN. 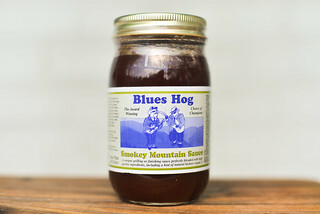 What started out as a hobby for the two became a full fledge team and business they've been running for over five years now, serving Northeastern TN and Southwest VA.
First whiff of this sauce fills the nose with a sweet, fruity, and tangy molasses-tinged smell. It has a bright, ketchup-y base that's amped up in sweetness. Behind the sweet tomato is a well balance mixture of vinegar, molasses, and Worcestershire that gives the sauce an overall standard, pleasing barbecue sauce aroma. This sauce is super smooth with a glossy sheen. It's dark maroon, but semi-transparent, which lets you see lots of small red and black spice specs throughout. It has a medium thickness with a syrup-like consistancy that has the sauce flowing in a quick and steady pour from a suspended spoon. Once the sauce slows and releases a few final drips, a thin, transparent layer is left clinging to the silverware. Not much difference between a spoonful of sugar and the initial taste of this sauce—it's all sweetness at the outset. It takes a couple seconds for anything else to come through, but when it does, it starts with a ketchup-like tomato flavor. 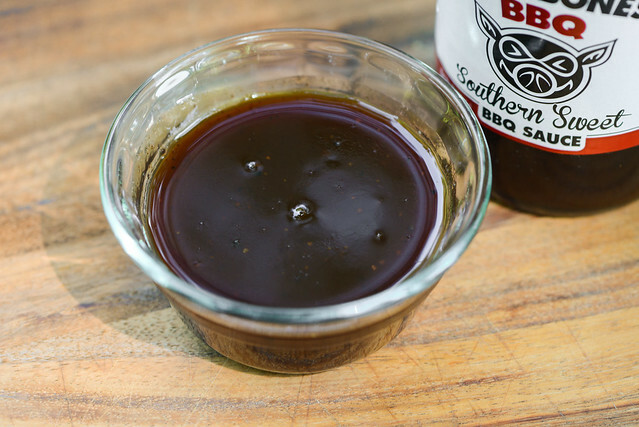 Then molasses gives it depth and really starts the barbecue flavor, which is intensified by Worcestershire next, followed by vinegar, which adds a tang that never quite overtakes the sugars. Finally a bit of pepper comes out at the end to lend a very mellow heat to the mainly sweet aftertaste. 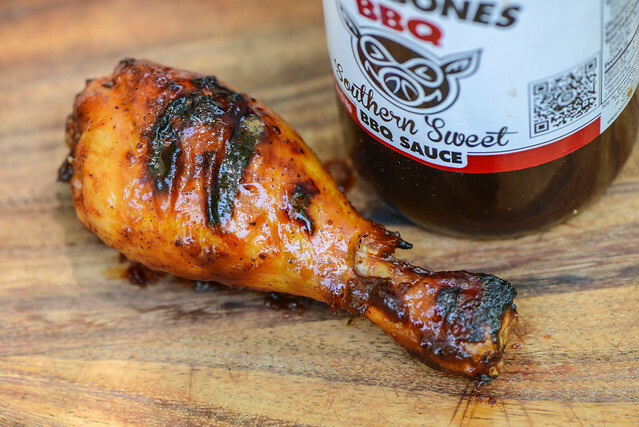 The first brushing of this sauce just slid right off the leg, but subsequent slathers held on fine, created a thin, even coating after the chicken's stint over indirect heat. Once moved to direct heat, the sauce burnt quickly, creating large areas of char. The flavor of the sauce still remained primarily sweet, but molasses had an increased presence, giving the sauce more body overall. Luckily, those blackened areas didn't taste burnt and were actually the best parts with their highly concentrated flavors, giving an overall boost to the final product. When Travis contacted me about trying out his sauce, he mentioned it was a "tomato based sweet sauce (the favorite type of sauce for this region)." If that's what people like around there, then he hit the nail on the head because one thing is for sure—this sauce is damn sweet. To me, this is competition-style sweet—mostly sugar with just enough additions to make it taste like barbecue. Personally, I find this amped up sugar content comes at the expense of really great layers of flavor and complexity that differentiates good barbecue sauces from the great. So while I appreciate that this sauce tasted clean and put together with quality ingredients, for my chicken, ribs, and pork, I like something whose sweetness is more balanced than in your face. 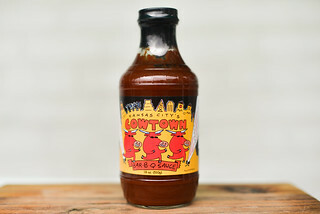 But hey, that's just me, and I bet this sauce is a real crowd pleaser and competition winner, because I've also come to learn that nothing satisfies all tastes quit like a quality sweet sauce such as Bare Bones Southern Sweet. You all can thank Travis for providing a second bottle to giveaway to one lucky Meatwaver. 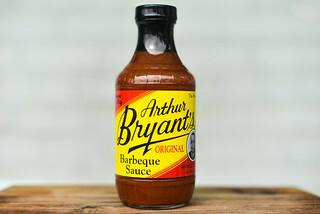 If you'd like to be entered to win this bottle of sauce, all you have to do is comment on this post with what item you just have to order whenever you're at a barbecue restaurant. Deadline for entries is 11:59pm on Tuesday July 19, 2016. Read the official rules for more details. One entry only per individual. Good luck! Believe it or not, I judge a lot of places by the quality of their sides. I'm a meat and 3 guy, usually pork ribs, spares not baby backs. Pulled pork, if you can cook that well you can pretty much do anything. Another vote for pulled pork. My favorite thing to have at a BBQ joint is potato salad. I'm a huge fan of burnt ends! It's all about the pulled pork for me! Oh, and some pit beans.